The route is approached from a long thin pullout (more like a wide spot in the dirt road) on the (southbound) right side of the road approximately 4.3 miles south of the main park road. Park the car, grab the pack, head east across the desert of the road. You will likely see some evidence of previous hikers, so try to match up with their approach path. You skirt a lump on the north and you will see the Star Wars Rock complex pretty much straight ahead. Head for that. 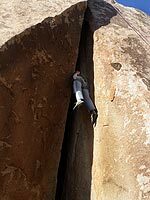 The inverted "V" looking rock where Between A Rock and A Hard Place is located is just down and right from Star Wars Rock. Approach time is around 20 to 25 minutes of relatively flat hiking. The bottom of the route is basically chimney, so you'd have to bring some pretty good sized Big Bros or a 12" Valley Giant if you want gear. When you get 40 feet up and the chimney starts to squeeze you can get in #5 and #4 Camalot sized gear that should get you to the top. 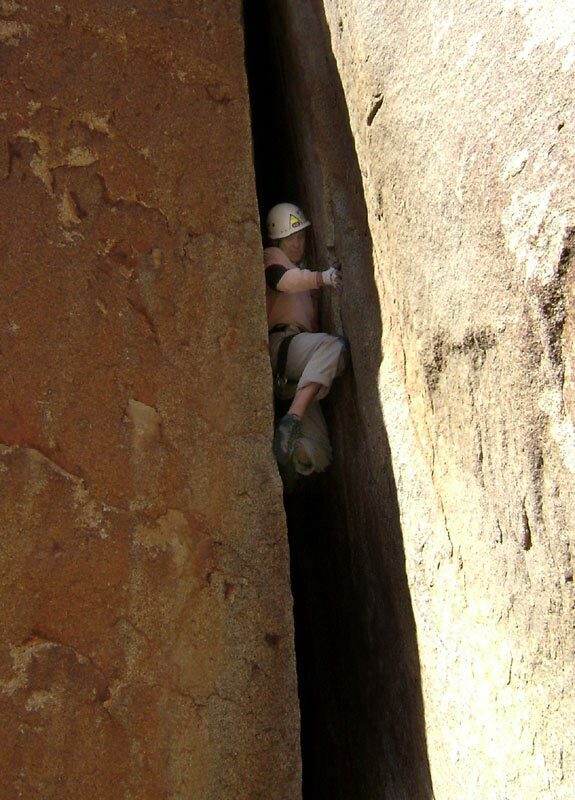 A belay can be set up in the main wide crack using #3-#5 Camalots, or you can bring a good selection of 1/2" to 1" stuff to place in the horizontal crack up and right of the finish of the wide crack at the top. Between A Rock launches with about 40 feet of 5.8 chimney climbing at the bottom. If you're solid on this, you could probably just drag along enough gear to slap in once you get up to the business (7" on down to fist sized), which is a tight squeeze. If you're smaller or thin, you should be able to squiggle your way through at the squeeze on some fist jams and left knee bars. If you're larger, things get pretty damn hard in a hurry and it's tough making progress through the crux. The rock throughout is pretty decent with good friction, and not much was peeling when we did it. If you want to TR the route, this is fairly easy to do, just grab a rope, bunch of runners (and one long extension), and a good selection of nuts and 1/2" to 1" cams. 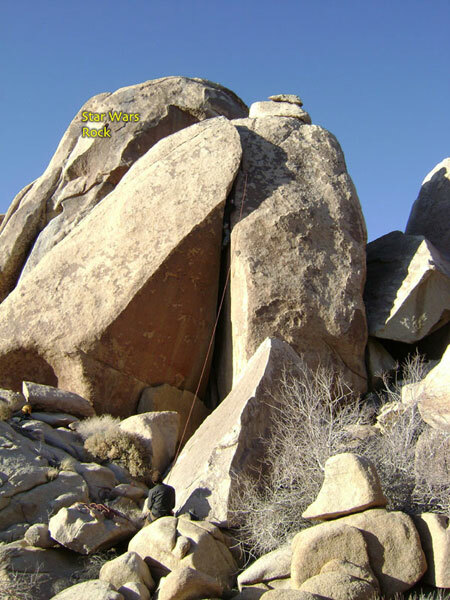 Scramble up the gully in back of this rock (between it and Star Wars Rock) and then up and over boulders to reach the top where you can rig a TR pretty easily in a horizontal just up and right of the wide crack. Placing the anchor there will help keep the rope out of a pinch where the chimney cuts under. While you're in the area, don't miss the nice cracks on Star Wars Rock, like Light Sabre (5.10b), Cedric's Deep Sea Fish Market (5.10d), and Thumbs Down Left (5.9), just up and left of this route. Perpetual Motion (5.10d) is a classic overhanging crack located just southeast of this area as well. See the guidebook for more info.